Before I forget, here's the picture of what Google Chrome looks like. 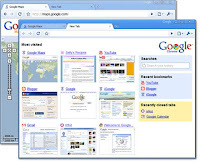 It is sleek yet very simple browser that will rock your web surfing experience. For Mac and Linux users, wait for a while. It will not take long for Google to release their issue for you. They are working hard in integrating Firefox coding with Google Chrome. I myself is already excited to use this new simple, but powerful browser.